Maya Menon's Blog: 'Busy-ness' over Business in our Schools? 'Busy-ness' over Business in our Schools? 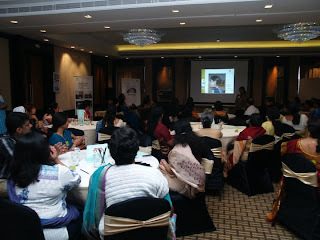 In February this year, The Teacher Foundation organised a series of short seminars for School Principals in 4 TTF centres - Bangalore, Mangalore, Hubli and Hyderabad. Nearly 200 heads from leading city schools attended these seminars. We posed a provocative proposition to principals in each city – that there is far greater focus on 'busy-ness' in schools today, than the actual 'business'(i.e teaching, learning & assessment)! I wasn't certain how many school principals would actually respond to the challenge – because after all they could be offended or see it as a threat to the status quo they struggle to maintain daily in their schools ! But for long I've felt that the routine of being swept away in a whirl of activities, contests and competitions every academic term, year after year, is a problem that schools need to examine carefully. So far there is little evidence that urban Indian private especially upper-end schools are even considering this an issue. So at the Principals' Seminars we encouraged heads of schools and members of school managements to examine the “Busy-ness over Business” syndrome from various perspectives. It was gratifying to see that after an initial hesitation, all the school heads participated enthusiastically. However only about 25% of them were actually willing to honestly critique their current practice – the majority of school-heads were more inclined to defend their daily busy-ness as vital and appropriate for managing today's schools. Let's review what the principals said – and what exactly it means. Broadly speaking they offered reasons for the 'busy-ness' of schools; acknowledged the negative aspects; some raised pertinent questions; and others suggested practical solutions. The reasons ranged from blaming media, technology and globalisation to explaining the need to focus on the holistic development of their students – to foster their creative, social and emotional skills. They also admitted that owing to increasing competition amongst schools, especially the newly established ones vying for student enrolments, there is a desperate need to be more 'visible' in the public eye. Competitions and events help schools reassure parents that their children are being provided a progressive education. Principals also emphasised that having a variety of activities – inter-house and inter-schools was indeed necessary to raise school standards and fulfill the aim and philosophy of their school. This seemed to be more rhetoric than any real clarity on what their schools stood for or what they saw as their real role as heads of educational institutions. However, there was a refreshing openness and honesty when we examined the negatives of this 'busy-ness' One principal ruefully stated that “school functions are given more importance than teaching learning – since they make us more visible ! Teaching-learning is the silent aspect – the public never gets to see it!” Others also revealed that in the tide that overtakes school-terms, values get lost and the child as a human being is forgotten. Moreover teachers' work is left half done - lesson planning gets affected, there is always a rush to finish portions and learning outcomes don't get fulfilled, leading to an overall sense of dissatisfaction. One comment that we heard was that “there is no time to reflect on the class taught and prepare for the next class”. Some questions were actually cries for help - “How do we handle parental expectations -both reasonable and unreasonable?”Are teachers being guided properly with the upcoming busyness - what strategies are there ? What and where is the concentration – when there is so much wavering? How do we create a rich learning environment without rushing through portions? Lastly were questions that suggested a lack of clarity amongst principals of what 'busy-ness' is and what a school's business needs to be! For example they raised questions like - Will business help our students be on par with the rest of the schools ? How can we cater to the holistic development of the child if we focus only on business ?If we focus on business aren't we ignoring the talented children? Such questions are problematic – because to me they convey a very narrow definition of what a school's business is - or at least how majority of senior school educators see it! The exciting trinity of Teaching, Learning and Assessment seem to be reduced to a mechanical covering of portions and evaluating students. In fact a crystal-clear emphasis on teaching-learning processes that are relevant, authentic and engaging would make many of the so-called extra or co-curricular activities that schools fill their term-time with, redundant! This would free-up time for teachers to strive to teach for understanding – providing both depth and breadth of coherent learning experiences for all students. Finally in our seminar discussions, the attending heads of schools offered some very useful solutions to the “busy-ness” vs business dilemma! But it will require them to have great courage, conviction and vision to create a counter-trend and actually carry out some of the suggested ideas. The solutions included making classrooms more student-centred rather than teacher-centred; training teachers – because their competence and confidence will show the best way forward; integrating all school activities to the curriculum; re-organising the assessment system and hold teachers accountable for their students' learning; having a measurement system other than report cards to demonstrate students' learning to their parents; instituting an independent rating system of schools – on clear quality parameters – based on which parents can decide which school to choose for their child/ren; collaborating with other schools in the neighbourhood to have combined gala events – like sports' day; staggering school events across 2-3 years – rather than cramming them all into one school year. All these are eminently do-able and I look forward to TTF being the catalyst to steer principals and schools towards a less flurried and more focussed functioning. I think the seminar did open a lot of windows. It gave everyone time to step aside from running on the expressway and to think and reflect about the rut and routine of daily 'busyness'.It is a pertinent question and I think the seminar did work like a GPS! Education is the main construction portion of your life. In order to build a good career from mba distance learning , you will have to have appropriate knowledge in yourself. It is said that the actual schooling starts from home itself. Well this has an inside consequence as the innovative schooling does starts. SliceofItaly provides the Egg/Eggless cakes, birthday cakes for kids online. Our online cake delivery store offers you a wide variety of delicious and soft cakes. You can order fresh and delicious cakes, delivery online.